My teen daughters and I did a 14-day hike of England's 191-mile Coast to Coast Trail in August 2018. We began at St. Bees and ended at Robin Hood's Bay; this documentation of our journey will hopefully be of use to those planning their own C2C adventure. Before I start posting our day-to-day details, here are some overall basics regarding preparation. We used Henry Stedman's guidebook, which we bought online, and maps we bought at the post office in St. Bees the day before we started walking. Note that there will be an updated version of the Stedman book available in November 2018. Get the guidebook six months before you want to hike; it lists all the possible campsites, youth hostels, hotels, and B&B,s and many of those accommodations book up early. 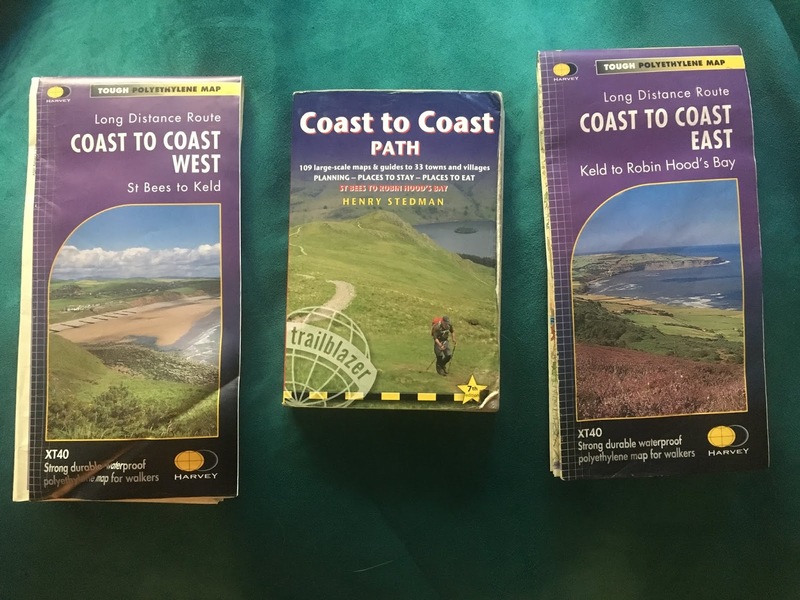 In addition, it lists details and helpful info regarding the possible travel routes/train and bus possibilities to and from London and Glasgow to/from St. Bees/Robin Hood's Bay. We found the book absolutely necessary; without it, your likelihood of getting lost increases dramatically. That being said, even if you look at the book's maps every five minutes, you'll probably get lost at least once anyway. Yes, that means you too, GPS users. Every single person we met had gotten lost at least once, even two who were faithfully using their GPS systems. Once in a while, there will be a junction with other trails, herd paths, water run-offs that look like paths, shepherds' paths, etc. etc., and you'll think for sure you are supposed to go this way or that way only to realize a mile later that you should have reached x by now or you should at least be able to see y...and you'll realize you're nowhere near where the path is supposed to be and that the book didn't talk about a critical junction and your GPS is just plain off. Consider it part of the fun, and be prepared out there with everything you need to spend a night out just in case. Be proficient with your map and compass skills. If you do get lost, chances are you'll run into other hikers who went the wrong way too, so at least you'll have company. On that note, never blindly follow the hikers ahead of you, because there's always a possibility they are a) going on the wrong way or b) doing a different trail entirely (junctions are rarely marked). We rarely used the set of stand-alone maps. That being said, when we went off track and climbed the wrong peak in the Lakes District, the giant map is what enabled us to go in the right direction in order to eventually find the correct trail. I therefore recommend having both a set of maps and the guidebook, even though you might end up relying solely on the guidebook. The guidebook is a fun read, and, before you start hiking, the maps are entertaining and mysterious. 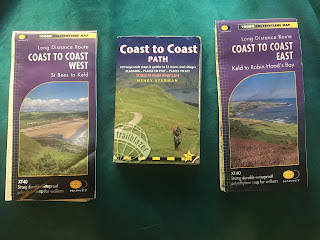 Instead of contour lines you get arrows, instead of the whole area's detail, you get trail-only specifics regarding what a Coast-to Coast walker should anticipate. The descriptions of the day are filled with history, helpful advice, information on where to stay, what the towns contain, bus/train info, etc. It's a fun read even before you set foot in St. Bees. Then, when you are actually walking, you will be so grateful the little details -- those little details will (most of the time) prevent you from getting lost. Following this book while hiking feels like participating in a cross-country scavenger hunt. Look for this small cairn here, this large landmark there, and oh yeah, beware the snakes. Half the reason this hike was so fun was because of this guidebook. You'll be grateful for the level of detail included in Stedman's maps! We met a few hikers who had a guidebook written and illustrated by Alfred Wrainwright himself. They enjoyed the detailed drawings but felt the maps were difficult to read. We have no experience with this guidebook ourselves, but here's a link if you'd like to check it out and do more research. If you are already an avid hiker, then you know what to bring. Wicking layers, fleece/puffy, waterproof pants and jacket. Hat and gloves aren't a bad idea either, even in the summer, since sometimes the weather is perfect hypothermia conditions (45-55 degrees and pouring rain). We had temperatures ranging from mid-40s to mid-70s on our hike. Fog, rain showers, and bright sunshine were all part of the experience (sometimes within the same hour). For footwear, we used trail runners. They got wet and muddy at times, but we are more comfortable in them than we are hiking boots. Others might prefer boots. YMMV. If you're not an avid hiker, then get thee to a reputable outdoors shop and tell them you need proper clothing for a thru-hike. Stay away from cotton. You only need one outfit to hike in, one to sleep in, and one as a spare. We go ultralight, so we had Gossamer Gear packs, foam sleeping pads (built into the backpacks), emergency blankets, clothing, water filters (which we only used once), and the usual first-aid stuff/sunblock. We didn't need bug spray and we didn't bring sleeping bags or a tent since we were spoiling ourselves with B&Bs on this trip. One can definitely backpack your way through if you don't want to spend the money on B&Bs and/or hostels, though. Stedman's guidebook has the info you need regarding where to camp, along with the names and numbers of hostels. We didn't do this; we never do. We always pack light, and we always want to have our raingear, fleece, etc. with us just in case. However, if YOU would like to pack many things and then hire a service to haul those things from B&B to B&B, here's a company with a great rep and, from what we hear, excellent customer service: https://www.sherpavan.com/trails/coast-to-coast.asp. The Sherpavan site has a lot of useful info on it about the Coast to Coast in general. It's well worth perusing, even if you're not planning on using the luggage transfer service.